700 Series syringe barrels are manufactured to the very highest possible quality delivering exceptional performance and consistency. From moulding to packaging, barrels are guaranteed to be free of silicone contaminants and imperfections. Kits contain an equal number of barrels packed with a choice of piston types. Syringe barrels are no-draft walls with consistent internal diameters. Pistons fit perfectly with pistons to guarantee consistent and highly accurate fluid dispensing as the piston moves down the barrel. Barrels are available in natural (clear) translucent, amber UV filter and black UV block. Pistons wipe the syringe as liquid is dispensed by a close tolerance fit. This eliminates air entrapment and fluid shear. Pistons are available in 3 styles to suit different liquid types. Use white wiper piston for general purpose and with most adhesives, use the blue easy flow for lower viscosity liquids and use the red flat wall for high viscosity, stringy glues. Use black rubber pistons for abrasive pastes of watery liquids that require a closer tolerance wipe. Industrial syringe barrels. Wide flange top and luer lock tip outlet. Natural (clear) translucent for use with most materials. High density polypropylene barrel. Medium density polyethylene wiper piston. Safe for use to 100 PSI. Silicone-free plastics. Each kit contains (50) barrels and (50) wiper pistons in the box. Industrial syringe barrels. Wide flange top and luer lock tip outlet. Natural (clear) translucent for use with most materials. High density polypropylene barrel. 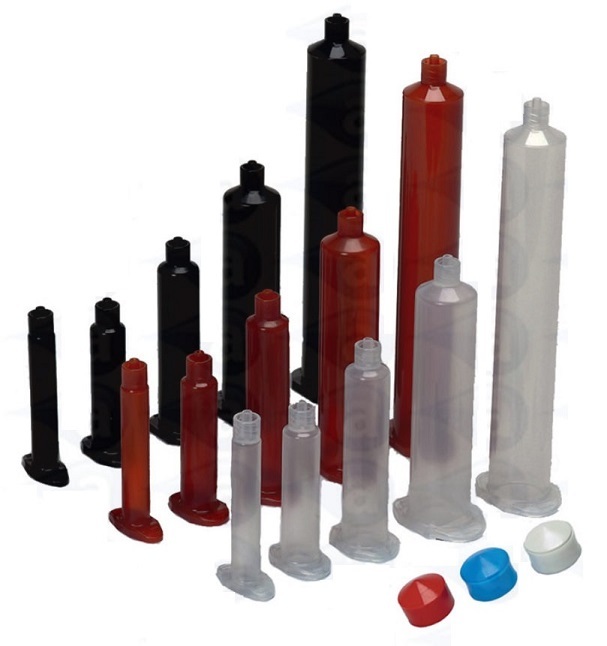 Medium density polyethylene red piston. Safe for use to 100 PSI. Silicone-free plastics. Each kit contains (50) barrels and (50) wiper pistons in the box. Industrial syringe barrels. Wide flange top and luer lock tip outlet. Natural (clear) translucent for use with most materials. High density polypropylene barrel. Medium density polyethylene blue piston. Safe for use to 100 PSI. Silicone-free plastics. Each kit contains (50) barrels and (50) wiper pistons in the box. Industrial syringe barrels. Wide flange top and luer lock tip outlet. Black (opaque) for use with UV cure & other adhesives. High density polypropylene barrel. Medium density polyethylene wiper piston. Use to 100 PSI. Silicone-free plastics. Contains (50) barrels and (50) wiper pistons in the box. Industrial syringe barrels. Wide flange top and luer lock tip outlet. Black (opaque) for use with UV cure & other adhesives. High density polypropylene barrel. Medium density polyethylene red piston. Use to 100 PSI. Silicone-free plastics. Contains (50) barrels and (50) wiper pistons in the box. Industrial syringe barrels. Wide flange top and luer lock tip outlet. Black (opaque) for use with UV cure & other adhesives. High density polypropylene barrel. Medium density polyethylene blue piston. Use to 100 PSI. Silicone-free plastics. Contains (50) barrels and (50) wiper pistons in the box. Industrial syringe barrels. Wide flange top and luer lock tip outlet. Amber (tint) for use with UV sensitive & other fluids. High density polypro barrel. Medium density polyethylene wiper piston. Use to 100 PSI. Silicone-free plastics. Contains (50) barrels and (50) wiper pistons in the box. Industrial syringe barrels. Wide flange top and luer lock tip outlet. Amber (tint) for use with UV sensitive & other fluids. High density polypro barrel. Medium density red polyethylene piston. Use to 100 PSI. Silicone-free plastics. Contains (50) barrels and (50) wiper pistons in the box. Industrial syringe barrels. Wide flange top and luer lock tip outlet. Amber (tint) for use with UV sensitive & other fluids. High density polypro barrel. Medium density polyethylene blue piston. Use to 100 PSI. Silicone-free plastics. Contains (50) barrels and (50) wiper pistons in the box.